"The perpetual question is a challenge not only to the power of God, but to His very nature: how can a good God allow suffering?" 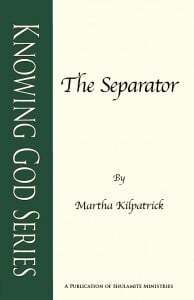 In The Separator, Martha defines the true roots of Christian unity as well as the causes of Godly separation through an exploration of Jesus’ own life and an amazing look at the story of Jonah. Furthermore, she warns of the dangers we face when we, as individuals or the church, choose to harbor someone who has set his heart to rebel against God. The Separator is now available in both print and digital format. lawlessness, or what fellowship has light with darkness? What agreement has the temple of God with idols? For we are the temple of the living God; just as God has said, “I will dwell in them and walk among them; and I will be their God, and they shall be my people. The obvious answer to all the questions is: absolutely nothing! Chapter 6 has become very real to me. I have experienced it all. In these verses, God promises that He will dwell in us, and among us, and be our God—and we will belong to Him. “Therefore, go out from their midst and be separate from them,” says the Lord, “and touch no unclean thing; then I will welcome you, and I will be a father to you, and you shall be sons and daughters to Me,” says the Lord Almighty. Paul is speaking clearly about those who are not truly born again. You can walk with people for years, assuming they are born again children of God. Then one day you discover that one of them is a pretend Christian, a liar and an enemy of God. We can be friends with an unbeliever. We can have social contact—as Jesus certainly did—but we cannot be in “partnership,” a word that means “yoked with another of a different kind.” We cannot operate as sharing Christ’s life and purpose together. When we discover that another is not truly born again we are to “come out from their midst and be separate.” The book of 1 John is all about knowing who is your brother and sister and who isn’t! We are to know by the standard of light and love, truth and reality. The family of God’s children is exclusive. It includes only those who are actually born from above. Only the sick and the sinner are eligible for the Savior (Mt. 9:12). Believers are those “who were born not of blood nor of the will of the flesh, nor of the will of man, but of God” (Jn. 1:13 NASB). Believers are not those who were born into Christianity through parents, nor those who made a “decision for Christ,” nor those who willed to be born again. You are either born again or…you are not! For another’s life, it is not something we can know apart from God’s light and His revealing. I recently came into something I waited for years to know: the realization of God as my parent Father. Not only that, but also the realization that I am His daughter— that is my identity. For a long time I had known that as truth, but I had not known the experiential joy of perceiving myself as a child of God. Nor did I understand that the prerequisite to experiencing that wonderful relationship is the cost of separation from imposters. The New Testament has numerous warnings from Christ Himself to be alert to wolves in sheep’s clothing (Matthew 7:15f). Paul knew it well and warned Timothy (2 Tim. 3:13). Jude, the half-brother of Jesus, wrote his whole epistle about false believers. The “IF” means there is a requirement before the realization of God’s fatherhood! In this passage it means that you must be in close relationship only with those who are truly born again and to have no “partnership”—no work or purpose—with those who are not! To have such “partnerships” is, in some way, to forfeit the full presence of the Fatherhood of God with all its benefits. The purpose of God is exclusive to His children. The functioning Body of Christ cannot be filled with false Christians. In fact it is prevented from functioning with the Father’s full blessing when unbelievers are inside the Shepherd’s flock. I have obeyed the Lord’s will in separation. I have studied the scriptures about it. Today I rejoice in separation. The fruit of separation is often reconciliation…to God as Father! In that verse, the word “separator” is capitalized. That is His name! He is a Separator! He said so a number of times throughout His ministry, if we would only hear it. We only know Jesus as the One who came to save—and He did! He did come to save, but He also came to divide. He made this very clear. Do not think that I came to bring peace to the earth. I have not come to bring peace, but a sword. But wasn’t peace what the angels promised at His birth (Lk. 2:14)? What is that contradiction? The birth of Jesus would bring “peace on earth” to the individual but not between people—no, not between men. a daughter-in-law against her mother-in-law, and a man’s enemies will be those of his own household. “I came to bring a sword” means it is a central issue, not a side issue. He is saying, “I came to do this.” Jesus came for the purpose of separating and dividing. He did not come to bring families together. He came to divide them. He came to make a chasm between the one who wants Him—and the one who does not. Sooner or later your loyalty to Him will be sorely tested and you will have to decide whose side you are on. And if you do not decide, it will be a “No” to God. There is no fence in the kingdom. You are in or you are out, depending on your loyalty the Lord. The sword is a weapon of violence, death…and healing! We have not understood that ultimately God will heal the family, but between here and there is a painful sword. Unity in the family is by the Spirit, not by having the same last name. Unity in the family is God’s goal, but it is going to be by the Spirit. Oneness on the basis of “we all have the same name and the same blood” or “we are all believers” is false unity, and God does not honor that. He sees His family as those who do the will of God, and He wants to bring your children, your spouse, your “whoever” into the will of God. Jesus was not bound to his own family. He was bound only to the Father. For whoever does the will of God, he is My brother, sister and mother. The only basis of Christian relationship is the will of God. Only in the will of God is there family, church and unity. Don’t expect, hope for, look for, or build harmony on any other ground. There is none! It is only in the will of God—that is our uniting. So the question is: Do you know Jesus, the Separator? Do you understand that we have an influence? This is the second principle of separation: I do not separate from people because I am too good to walk with them and they are beneath me. That is not the issue. I do not come to separation because I am so spiritual and others are not. Beware of the yeast of the Pharisees. I do not have time here to explain the yeast fully, but the yeast of the Pharisees is the willful religion that serves God but not His way, not by His will, and has no interest in the Person of Jesus and His opinion. The presence of tiny amounts of yeast permeates the whole. That rebellion you cannot live around; you are too weak. You are a sheep. You are too easily led astray. You will be infected. Don’t walk with a fool or you will be a fool. Do not be deceived, bad company ruins good morals. It is very difficult to be in relationship with an unscrupulous person because that relationship will always fall to the lowest element of morality that is present—and you cannot live with that. Smith Wigglesworth said he had no intention of leaving men the same when he walked by. He came to make them glad or mad, and he didn’t care which. We play it too safe and that is for our own sake, not His. We don’t want to risk criticism or rejection, or even loss of reputation! However, the Gospel of Jesus Christ is a gospel of confrontation! If you don’t see Jesus as confrontational, I question whether you see Him at all. Jesus confronted the Pharisees knowing full well that it would cost Him His life. And that assault was for their sakes and it did instigate His death. In the world there are two roads, and two masters, and they go in opposite directions. How on earth can you walk with someone who’s going in an opposite direction? John Wesley understood the confrontational nature of the Gospel. I heard that once he was traveling on his horse to another church and he realized that he had not been persecuted in three days. See, we don’t have any of that mentality. We don’t have the mentality of suffering for the Lord. We don’t expect the world to hate us, though Jesus promised it would. Now, Jesus ate with sinners. You can fellowship on a level with vile unbelievers. I am not talking about that. I am talking about Jesus rejecting the Pharisees who claimed to know Him. He gave them a scathing rejection—accompanied by name-calling and threats. We haven’t understood that side of Him. We haven’t truly seen it! Jesus would have nothing to do with them and neither would John the Baptist. Jesus called them snakes and vipers, and they are! You live with the religious and you will die of their poison! The religious are vipers. Do you know what a viper is? It is the most poisonous snake in the world. I want to show you a different aspect of a familiar story in the book of Jonah. Jonah was a man whose will was not surrendered to the Lord. He had a specific assignment from the Lord to go to Nineveh, and instead he ran and got on a ship that was going to Tarshish. What I want you to see is what happened to the sailors on the ship, because they were around a man whose will was not surrendered to God’s will. Jonah rose up to flee to Tarshish from the presence of the Lord. He went down to Joppa and found a ship going to Tarshish. So he paid the fare and went on board. But the Lord hurled a great wind up on the sea and there was a mighty tempest on the sea, so that the ship threatened to break up. And then they said to one another, “Come let’s cast lots so we can learn on whose account this evil has come upon us.” So they cast lots and the lot fell on Jonah. Now we are so sophisticated that we don’t understand that trouble sometimes comes because God is pursuing a rebel. Of the sailors’ simplicity we might derisively think, “They cast lots?” No, dear believers, they were wiser than us! Great storms of trouble are because God is after something and somebody. I have often assumed that the storm is because He’s after me—and I am just waking up to realize that sometimes I have a Jonah in my midst who’s fast asleep and safe, and I am bearing the storm because I have given that one shelter from the purpose of God! That’s the question we must ask God about everybody: “Who is this person? !” I don’t know. I won’t know. I have to understand that I will not know. I know that people can tell me what they want me to believe. And I have been deceived. They can tell me what I want to hear so I will say, “Yes, you see,” when they do not and will not. I do not know the hearts of people. I cannot know. Only God can show you who a person is. Only God can alert your spirit. If I had followed my spirit more, of just baffled aversion to people, I would have been much safer. My spirit knows…if I will heed it. I learned of a program where they train children how to deal with an attacker. One of the things they tell children is: “Follow your instinct.” In every case where a child has been attacked, the child had an intuition, “Something’s not right.” So the people leading the training told the children, “If you feel that feeling, RUN!” Isn’t that interesting? In every case this man said (and it was not a Christian program), “These children know instinctively that something is happening.” In my case, I assure you, I should have followed my spirit instead of my head and instead of believing the lies people told me, things that were not true. So the sailors said: “Who are you? Where are you from?” Those are good questions. Jonah answered: “I’m a Hebrew. I fear the God of heaven, who made the sea and the dry land” (v. 9). Jonah didn’t fear God. He lied! One of the greatest shocks of my adult life is that people lie. That has just been a continuous shock to me. I was reared by very good, ordinary people who worked hard, and they shielded me from knowing there was evil in the world. But they did not deceive me. They weren’t devious people. I grew up to be bewildered by evil and by the fact that the (seemingly) best people are sometimes complete liars. Jonah didn’t fear God; if he had, he would not have run. The whole thing is about the fear of God! So the men became extremely frightened and they said, “How could you do this?” For the men knew that he was fleeing from the presence of the Lord because he had told them (paraphrased, v. 10). You see, sometimes people will tell you who they are. We need to listen. It will slip out in different ways…so listen! Then they said to him, “What shall we do to you that the sea may quiet down for us?” For the sea grew more and more tempestuous (v. 11). There may be someone in your life whom you are tolerating—asleep in the hold of your ship—that is causing the storm to increase. Jonah said, “Pick me up and hurl me into the sea…it is because of me this great tempest has come upon you” (v. 12). I do not even admire that. In fact, I despise Jonah’s response. Jonah would rather die than go to Nineveh. He would rather die than obey God’s will. Well, the sailors wanted to be good and don’t we all want to be good? So they tried to row. They tried desperately to return to land and they could not. You cannot return to land until you get rid of the man who is a rebel! Perhaps it is only in your affections that you must get rid of him (or her). Perhaps it is in fellowship. Perhaps it is just as the scripture says: withdrawing. Perhaps it is confronting. There are several ways to separate. God will have to tell you like He has to tell me—specifically, every time. Lord, we don’t want to kill a man! Nobody wants to break a fellowship! Nobody wants to say: “Don’t call me. Don’t speak to me. I’m not speaking to you again!” Nobody wants to do that. It is a real test of loyalty to God. And it feels just that way—like you are throwing somebody out in the ocean and there is nothing that can save them. So the sailors prayed. But you see, the sailors benefitted from this experience because it drove them to pray to a God that they didn’t even acknowledge before they met Jonah. Jonah was an evangelist even if he didn’t mean to be. They prayed, “Oh God, don’t let us do anything wrong!” (1:14) And that is the prayer you pray. You must go in fear and trembling and much prayer about separation. There have been times that I have prayed for months before I moved on a separation, in this same way: “Oh God, don’t let me harm somebody. I do not want to kill an innocent person. I do not want to hurt somebody unnecessarily.” You have to go through that agony. Otherwise, you might not be trustworthy. So they picked up Jonah and threw him into the sea and the sea stopped its raging. It is amazing that some things happen in our lives because people curse us, and we don’t know they are cursing us. We suffer and suffer and suffer until we throw them out and then we’re free! And you see, when they threw Jonah out, God had a way to get his will broken. If we spare people that God is not sparing, God will not spare us! One time in business, God showed a prominent man that he was standing in the way of a man under God’s judgment. God showed him that if he stood in the way, he would get the same judgment as the man. So he had to fire the man though it broke his heart. But he knew that otherwise his own life would be in that storm, just like this story of Jonah. See, when you throw a man out, you throw him out to God. Don’t comfort people who are disobedient! Don’t comfort the rebel! Don’t give the rebel sanctuary, and blessing, and protection. He will go to sleep on you and you will die! Don’t give the rebel a pillow. Throw him to God and let God deal with his will. The rebel is God’s business. I have had to learn so painfully, and at such great cost, that I cannot make a person want God. I cannot do it! I can help the one that wants God. Oh, I love that. Come! I can even help the fearful person that wants God: “I want to go to Nineveh, but oh, I’m scared. What am I going to do?” I can help that one, but I cannot help a Jonah. I will die trying! My own spiritual destiny and even my relationship with the Lord will die. Let me tell you what happened to the sailors after they got rid of Jonah. Jonah 1:16 says, “Then the men feared the Lord exceedingly” (v. 16). Oh, He is awesome. He is an awesome God! He will sometimes send you a rebel to teach you to fear Him, to teach you to fear not being loyal to Him, to teach you to fear that if you don’t obey Him, you are going get it, too. I mean, He is God! My God is an awesome God! I don’t recognize the insipid ‘God’ that is presented as one who lets you do whatever you like. I have never met him! I have never met the ‘God’ that will let you worship your husband and your children, and get away with it. I have never met him! My God wants me to belong to Him. And He moves, and He strikes, and He brings the sword! He doesn’t mind what He does to bring me to that place. And I praise Him for it! “They offered a sacrifice to the Lord and made vows” (v. 16). In other words, they worshiped! They met God—the real One, Who loves you enough to bow your stubborn neck at any cost, Who will scare the liver out of you to get you in His arms. That’s Who He is! Don’t spend your energy and time striving with a rebel. Let him go his way. God’s got plenty of whales out there. He is still working with whales. He can do it, but you cannot. You cannot walk with a rebel.